After a truly sumptuous breakfast we went prospecting for gold. The town of Waihi sprang up around its Martha mine – a huge open-cast hole in the ground (now 250m deep) which was begun in 1878. 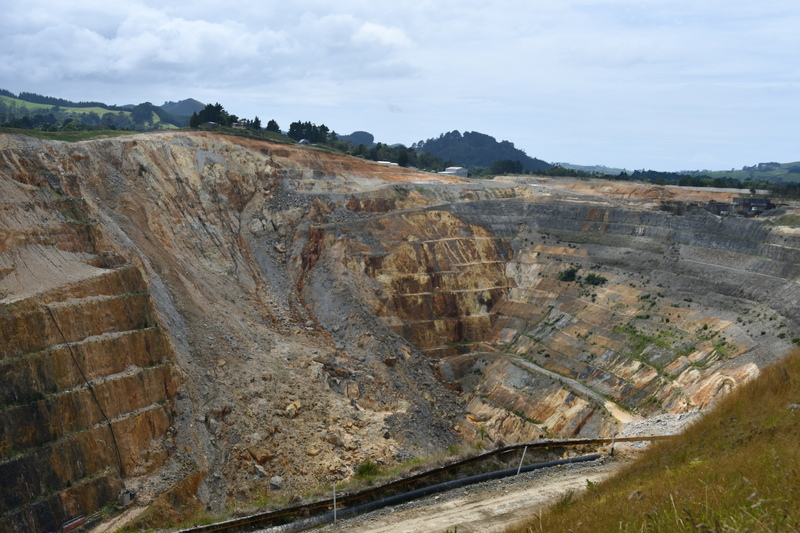 It was NZ’s richest mine and has produced prodigious quantities of gold and silver until it closed in 1952. I guess the price of precious metals must have gone up, because it was re-started in 1988. A side collapsed a couple of years ago so its operations are paused pending stability. 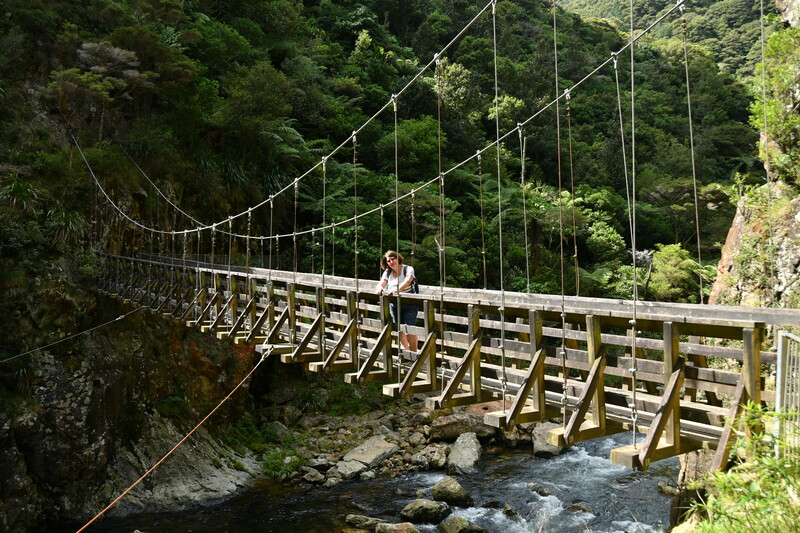 A few km away is the Karangahake gorge, a deep river gorge and also a gold-mine, started in 1875 and productive during the early 1900s. It was the site of the biggest quartz ore processing plant in Australasia and in its hey-day a town of 2,000 miners and their families lived there. 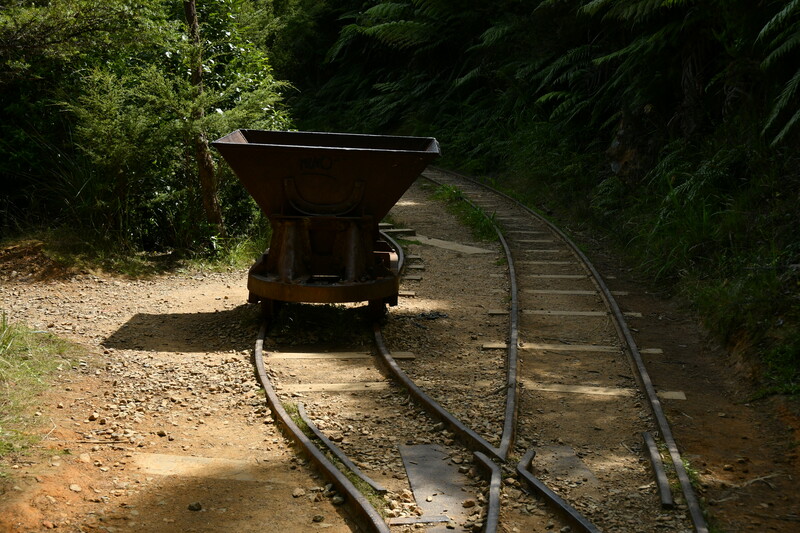 It is now all but deserted, its workings abandoned and is a fascinating museum of industrial archaeology. 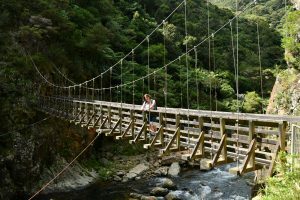 We walked a few km through the gorge along its fast flowing river; across suspension bridges; through pitch-dark dripping tunnels (we had our torches) tripping over railway lines to emerge high in the gorge. It is sobering to think of the awful working conditions of the miners. A strange stuff is gold. Almost completely useless apart from being chemically inert, malleable into fine jewelry and a good conductor of electricity. For some strange reason is has been promoted to the very definition of wealth. People have risked all to dig it out of horrible holes in the ground, fought over it and died for it, traded it so that it can sit, as useless ingots, heavily guarded in other huge holes in the ground. And we think animals are stupid? 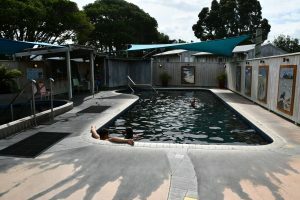 We end our exploration with a geothermal indulgence by visiting a local hot pool that is filled each day with water at 40 °C that bubbles up from a hot ground well. What a delicious thing to have in your village. A swim and a wash all in one. It is now wine o’ clock and we dine well and sleep the sleep of children. I figure we have worked off the jet-lag.